Are you looking for an interesting and unusual high end promotional product? We would like you to divert your attention to the new type of marketing gifts – floating products. These will look perfect in any interior and a unique lamp like this will surprise anyone. This beautiful and stylish floating Lamp’s shade consists of two parts which doesn’t come into contact with each other: the top part of this magic lamp hangs in the air over the bottom part. How does this high end promotional product work? This lamp looks really unusual because of its complex structure, consisting of a system of magnets and electromagnets. 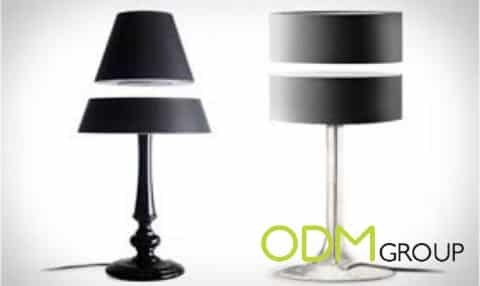 The bottom part of the lamp’s shade has powerful electromagnetic device that controls the magnetic disk, which is lifted and hovering at heights of 3 cm above the bottom of the lampshade. An additional advantage of this lamp is that by touch control you can adjust the number of working LEDs. For example, you can light up only one of the series, or both. This gives users the opportunity to adjust the intensity of light and, if necessary, even cover it. The only restriction in the use of this levitation lamp is the possible electromagnetic disturbance. Therefore, the magnets should not be installed near electronic and electrical devices. 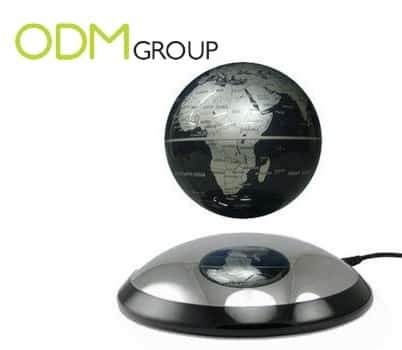 Why the floating lamp is a great high end promotional product? A levitating lamp is incredibly stylish and it is a unique promotional product that will not leave anyone indifferent. It will look perfect in the apartment or the office. In addition to its aesthetic beauty, this floating lamp still carries the practical benefit. It allows to change lighting conditions in the room, the intensity for each concrete moment, which makes it economically-friendly. Such a promo gift just can’t leave you without pleasure and extra attention. It will be well appreciated and will cause the most positive emotions. 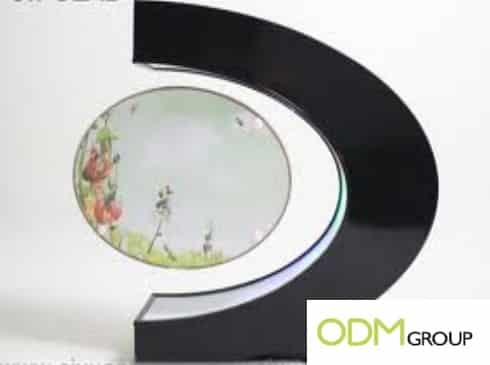 If you liked the idea of this promotional product, you may also like a floating globe and photo frame. Working with the same mechanics, they will be able to decorate your office or home interior. It will be an amazing marketing gift to your customers, colleagues or business partners.